CHH Sites at Jackson St. and Hess St. Within the next decade, the number of seniors in Hamilton will double. In order to facilitate successful aging, CityHousing Hamilton (CHH) provides senior residents with wellness programs. However, low engagement in these programs means residents are not receiving information on identifying and managing chronic illnesses, which then threatens the sustainability of our healthcare system. Robert, Zoë, Coomal and Gagandeep created a study design and applied for Research Ethics approval. They surveyed staff on the barriers to resident engagement and compiled a summary report with information from staff, students, and program instructors on most prominent barriers to engagement, finding them to be language, mobility and eyesight. Finally they used their summary report to develop a focused survey for residents to clarify and confirm initial findings from staff surveys. Next, the students will implement multiple trials of their proposed solution which may include new promotional and/or engagement strategies. Once that is complete they will analyze and evaluate the effectiveness of each trial to provide information on lessons learned and recommendations for long-term use. 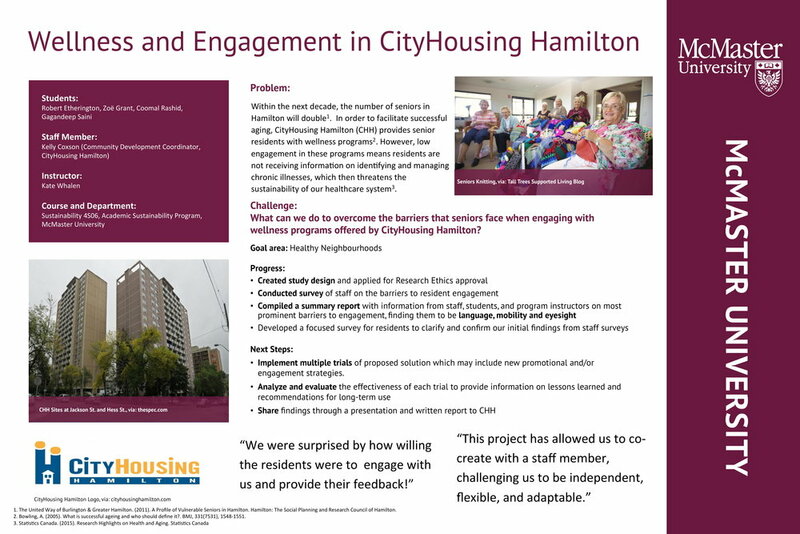 Ultimately they will share their findings through a presentation and written report to CityHousing Hamilton.